Rich and I are fortunate to have the opportunity to spend some time this summer in The Villages, Florida. 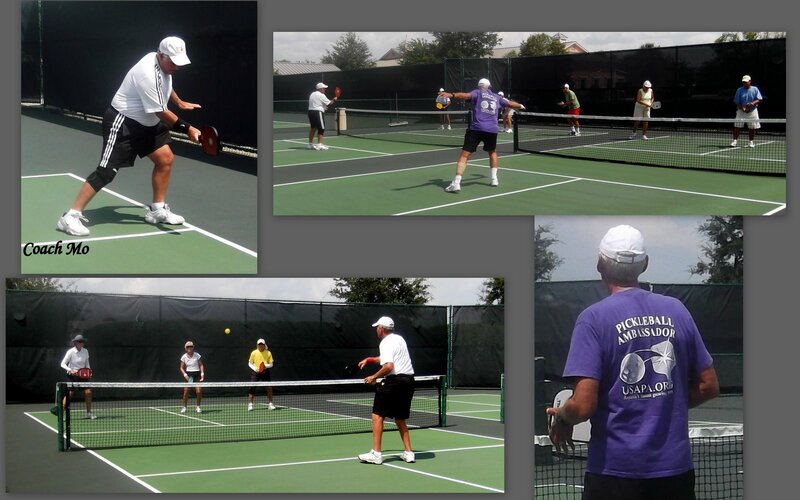 The Villages is probably one of the very largest pickleball communities in the country today, and it is also home to one of the very best pickleball instructors, Richard Movsessian, aka Coach Mo. Every Monday, residents here can attend a FREE Pickleball Skills Clinic geared to improving technique, strategy and .... having a lot of fun. Coach “Mo”, assisted by other Picklball Medalists, conducts a clinic from 3:00 - 4:30 PM at the Churchill Recreation Center Courts. The Clinic consists of 2 sessions held on consecutive Mondays. Even during the summer, when many of the snowbirds have gone north, the sign up sheets fill up fast!!! While visiting here, I have had the opportunity to participate in the clinics, while Rich has worked along side Coach Mo as one of his "assistant coaches". Above, Rich, Coach Mo and Pete, one of the other " assistant coaches" demonstrate and work with the participants. 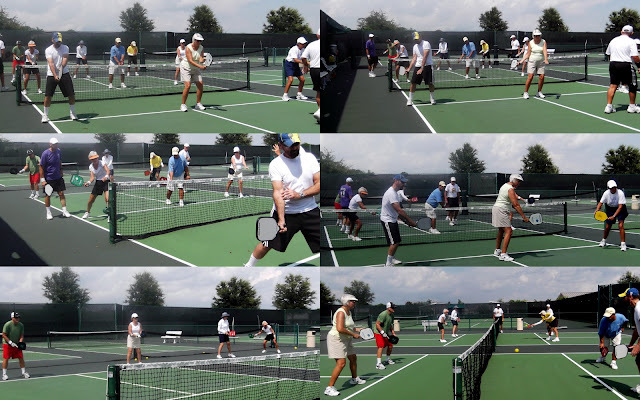 Here are some of the folks that were attending this past Monday learning the proper grip, forehand and backhand strokes and then doing drills practice those as well as the "soft game". We have never met anyone who enjoys "teaching" the game as much as they enjoy playing, and anyone who wants to improve their level of play takes advantage of his excellent instruction. Even visitors or guests at The Villages can take advantage of his training. This picture was taken after USAPA Ambassadors George and Anita Rimler (left) from Daytona Beach Shores finished their "private lessons" with Coach Mo. Rich (far right) and I joined the three of them for a pickleball story sharing lunch before they headed back to the east coast. The Villages is a great place to play pickleball..................and they have so many high level players because they do an outstanding job of teaching people the game and helping people to improve their skill levels. Training is also available from Deb Harrison, another community Pickleball Teaching Professional. Deb Harrison works through the Lifelong Learning College. She is one of the very best -- a gold medalist many times over in highly competitive local, state and national competitions. She is well know for her professionalism, patience and excellent communications skills. Several individuals and groups have spent time with Deb and were extremely pleased with the lessons they received. What a great place to live.........What a great place to learn and to play pickleball.